Following the release of the KV-1 Heavy Tank, Tamiya introduces a 1/48 scale model of the KV- 2 Heavy Assault tank. Based on the same chassis and hull as the KV-1, the KV-2 features a 152mm howitzer and a monster-sized turret to house the huge gun. This is the latest 1/48 Russian item to join the Tank Destroyer SU-122, T34/76 Medium Tank and Russian Infantry and Tank Crew Set. Following the creation of the KV-1 heavy tank, the Soviets produced a variant model armed with a short-barreled 152mm howitzer mounted in an impressively large turret. The so-called KV-2 heavy assault tank was developed as a more heavily armed tank, intended to target bunkers and other enemy strong points. The tank carried 36 High Explosive rounds for its main gun, and featured a machine gun for secondary armament. Like the KV-1, the KV-2 featured thick armor that rendered it immune to everything but artillery and aircraft fire, and was capable of posing a formidable threat to the invading Germans. However, it was also handicapped because of its heavy weight, which reduced speed and maneuverability and contributed to a higher number of breakdowns than the KV-1. 334 KV-2 units were built between November 1940 and November 1942, before production factories were captured or forced to relocate due to the German advance. 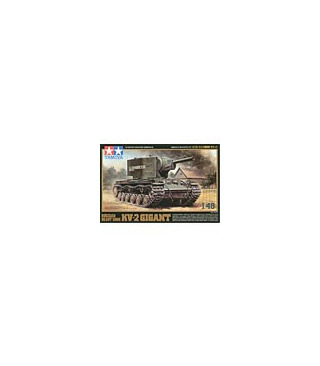 * Detailed 1/48 assembly model kit of the Russian KV-2 Heavy Tank. * Includes diecast chassis for added weight and realism. * Model accurately replicates 152mm howitzer and large size turret. * Gun and turret can move, and hatches on top and rear of turret may be opened or closed. * Assembly type tracks come with straight parts made of single pieces. * Includes 3 types of turret slogan decals.